Google created a site for Windows 8 users: "Get Your Google Back". The site encourages users to install the new Google Search Metro app and Chrome, which is not available in the Windows Store and can't be installed in Windows 8 RT. 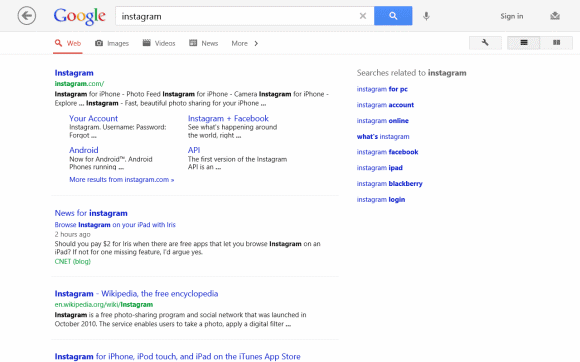 The Google Search app looks just like the iPad app and offers similar features: voice search, a new interface for image search, Google Instant, shortcuts to Google's apps. There's one more thing: "the doodles you enjoy on special occasions will be right there on the homepage and even show up on the Google tile on your start screen". It's surprising to see how many apps bundled with Windows 8 integrate with Microsoft's online services. There are apps for Bing Maps, Bing News, Bing Travel, Bing Search, Bing Weather, Skydrive. Microsoft didn't include Windows Live Essentials in Windows 7 and one of the reasons was probably the antitrust concern. Microsoft had to remove Windows Media Player in a special Windows version for Europe and add a browser ballot window to help users install other browsers. Now Microsoft still has a dominant position in the operating system, but it's not concerned about bundling antivirus software, apps for online services, an app store that limits user choice (especially for Windows RT tablets). That's quite risky. Any changes by Google is highly welcomed. Lets hope for the best. The question to me is, is Google developing anything for Windows RT? Beside the Google search which is a wrapping of all the HTML applications I have not seen anything else.